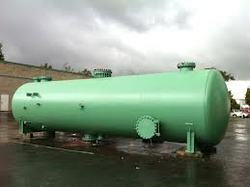 A pressure vessel is a container that is normally made of steel, which is designed to store gases and liquids in conditions or at a pressure that is substantially different from that of the surrounding environment. It may also refer to an enclosed structure that has a nuclear reactor core inserted in a pressurized coolant. We provide a wide range of Pressure Vessels for our clients based not only in India but also in UK. These are manufactured from 300 grade stainless steel, SA 516 GR 70 and carbon steel. Moreover, these are quality tested on well-defined parameters before being delivered to our clients. Specificationsof Pressure Vessels: Industry Segments Serviced: chemical, fertilizers, food and dairy, petrochemical, pharmaceutical, chemical, pulp and paper.